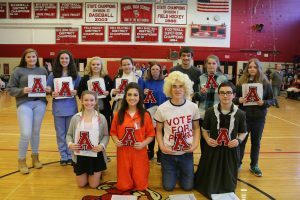 Students at AHS recently received awards for academic achievement during Spirit Week. 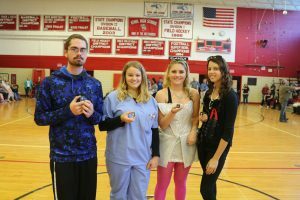 Students received a silver pin for maintaining an 80 or better in all subjects for every term for the last 3 years. These students have already received a silver certificate and a silver letter. Students who received a silver letter for maintaining an 80 or better in all subjects for every term for the last 2 years. These students have already received a silver certificate. Hannah Lajoie, Crista Jillson, Makayla Raymond, Francine Morlock-Rajaniemi, Carlee Croteau, Chase Michaud, Mercedez Young, Emily Vescovi. 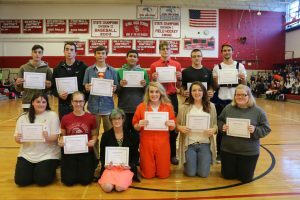 Students who received a silver certificate for maintaining an 80 or better in all subjects for every term last year.